The spacious rental condos at Shorewalk are more than just a "place to stay." We offer a wide range of onsite amenities that will provide you and your family with fun-filled days, everyday. Look forward to waking up and enjoying the comforts of your own home away from home and step outside to 30 acres of fun and excitement. Shorewalk is bringing paradise home. To provide you with the best possible experience throughout your stay, Shorewalk offers a variety of activities that are guaranteed to keep you busy and happy. Want to work on your tan while enjoying the soothing pool atmosphere? Enjoy our 2 heated outdoor swimming pools or spend some time in one of our 2 Whirlpool spas with your favorite drink and relax! Need a place to entertain the kids? Our playground is located right next to our pool area for maximum supervision of your children. Like to cook? Enjoy our BBQ grills and have a party with your family and friends. Sports fans? 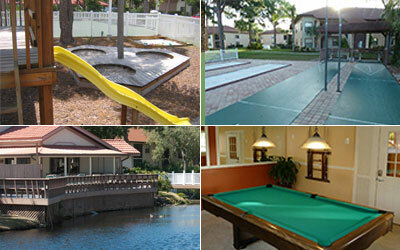 Shorewalk offers 2 lighted tennis courts and 1 basketball court for your enjoyment. Gone fishing? Shorewalk has 6 stocked fishing lakes that operate on a catch and release program. Fish from the shore or from one of the bridges located on the property. Golfers? Numerous golf courses are located nearby for a good game of 18 holes. There is even a golf course directly across the street. All Guests must sign in at the clubhouse to pick up their Pool Pass. A $10 deposit is required and is refunded when pool pass is returned to the clubhouse. And be sure to visit one of the many world renowned beaches located within short driving distance from the property! At Shorewalk, we want you to enjoy every aspect of your stay with us. By providing you with a centralized location to downtown Bradenton and surrounding areas, everything you need is literally a short distance away. This convenience is an integral part to your stay and it is something we strive to deliver to our clients every day. Need a lift? We've got you covered with our public transportation routes provided by local city buses.